Weezie Foley is determined to win the Christmas shop decorating contest this year, but her competition is fierce. At the same time, she's dealing with a boyfriend who hates Christmas, a dog that runs away and is returned mysteriously, and all kinds of crazy family problems. Will she make it through the week leading up to Christmas without falling apart? 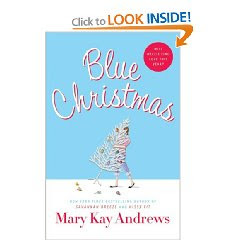 I picked up Blue Christmas at the library from the holiday reading shelf. I didn't realize at the time that it features characters that were developed in two previous books - Savannah Blues and Savannah Breeze. This took a bit away from the story for me, because I could tell there were a lot of references to the past that must have been covered in those previous books. But it still had a standalone storyline that made sense without the background the other books. I felt like the story was very predictable and a little hokey. It's really more of a chicklit book - certainly not a heavy, meaningful book about the meaning of Christmas. But it was a very quick read, and since I haven't read something like this in a while, it was a nice change of pace. I'm a sucker for an occasional chick lit book, even when they're predictable. I'll keep an eye out for that. I really enjoyed this but I read the first book. She really delved into Daniel's story in Blue Christmas, which I liked.